Crest Ridge Saddlery starts with expert saddle fitting to produce the best saddle, saddle pad and tack for your horse or mule. Our approach is the same regardless if you are riding a gaited horse, stock horse, draft horse or mule. You form a unique combination with your equine. Each saddle is built to order using your measurements. A master saddle fitter uses your measurements to select which one of our 19 different trees will provide the best fit for your equine partner and advise you which of our models work best with that tree. Since each saddle is built to order, you also have the opportunity to have your saddle customized at a surprisingly affordable cost. Instructions on how to measure your horse can be found by clicking on the "How-To Measure Your Horse" link found in the banner on every page. We design and produce all of our saddles, tack, and saddle pads here in the United States. We provide you exceptional value by combining saddle fitting, top-of-the-line materials, everything custom built by Amish master craftsman, outstanding customer service, and the reasonable prices possible with a family owned and operated business. 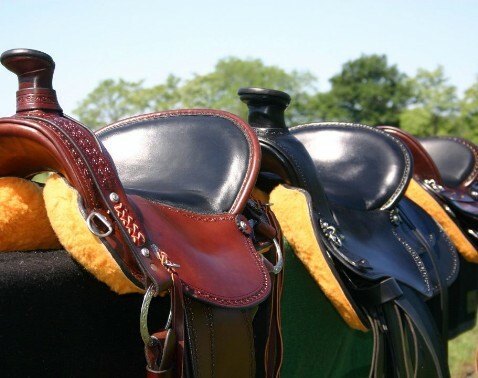 We stand behind our products and guarantee saddle fit and the quality of our tack. We welcome your visit and thank you for considering Crest Ridge Saddlery for all of your saddle, tack, and saddle pad needs. any Questions of if you need Anything! We guarantee the fit to YOUR satisfaction duing the trial period. CRS is always on the Move! Watch our FaceBook page to see where we are headed. If you need a fitting, contact us and ask to be included on our route and we will come to you!